Augmented Reality provided the perfect platform for these intricate anatomical visualisations. We created a medical training app for Allergan which demonstrated a range of BOTOX injection procedures for the treatment of migraines and facial alterations. 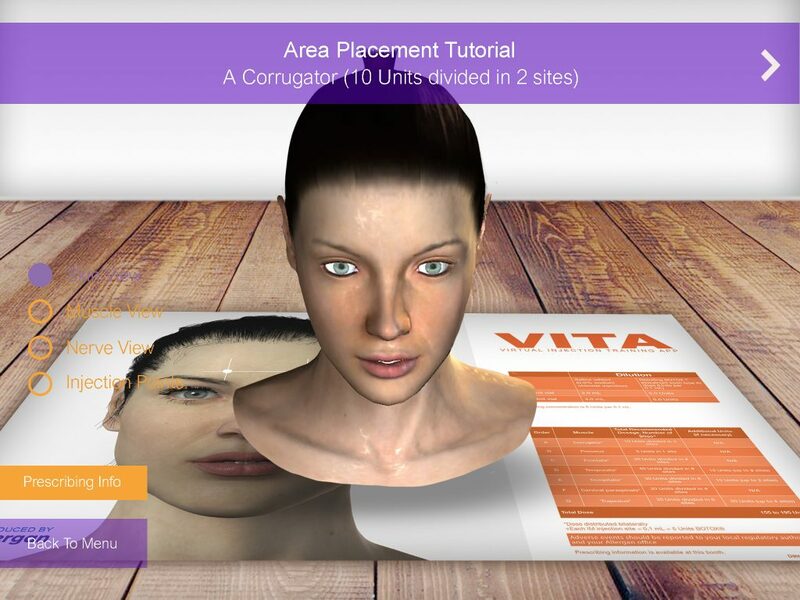 The app allowed users to explore the relevant procedures and watch virtual demonstrations on a 3D human head. The injection points were locked onto the 3D model and highlighted using red circles and annotations. This provided an easy to understand and clear way to learn about the procedures and also provided a beneficial 360 perspective on the 3D patient which served as a more useful way of demonstrating the injections than paper instructions or videos would have. Each section of the app was also accompanied by a voice over explaining what was happening on screen to guide users and clarify the precise information needed to administer the injections. We were also able to include a layered view functionality that enabled users to view the demonstrations from skin, nerve and muscle perspectives. See how the app works here. Want to view more of our medical case studies? Find them here.